1. 424 – 6 B.C. The Intertestamental Period- Nehemiah 13 and the book of Malachi record the last historical events and the last prophecy, respectively, of the Old Testament. Over 400 years would pass between those events and and the opening of the New Testament. Although God was still at work in the world and in the lives of His people, Scripture does not record anything from this time period. There was no prophetic word from God during the Intertestamental Period, thus, it is often called the 400 years of silence. 3. 334-331 B.C.- Alexander the Great conquers Persia and gains control of all Persian holdings, including Israel. Greek rule is established by 332 B.C. 4. 301-198 B.C.- After the death of Alexander the Great, his generals vie for control. General Ptolemy I Soter sets up the Greek Ptolemaic dynasty in Egypt (later demanding to be made Pharaoh). Ptolemaic rule of Israel begins. 5. 198 B.C.- Another Greek, Antiochus the Great defeats the Ptolemaic dynasties and takes over. He persecutes Israel to the extreme, not allowing them to keep the Sabbath, forcing them to offer unclean sacrifices, and eat unlawful foods. 6. 166-142 B.C.- Mattathias, a Jewish priest, and his five sons lead the 24 year Maccabean (named for Judas Maccabeus, the oldest son and leader) Revolt against Antiochus. The Jews eventually won their independence (though they still retained many Greek ways), and Mattathias set up the Hasmonean dynasty of priests (unbiblical since priests could only come from the family line of Zadok, and his family did not) to govern Israel. 7. 63 B.C.- Rome takes over the known world, including Israel. 8. 37-4 B.C.- Rome sets up Herod the Great as king of Israel. He is still king when Jesus is born. The stage was set. After four hundred years of silence God was about to speak again, act mightily on behalf of His people again. And it all started with two godly women. It’s helpful to remind ourselves right from the start that, although we know something amazing is about to happen, Elizabeth and Zechariah had no idea. They were just regular people going about their daily lives. 5- Zechariah was a priest, but Elizabeth was also from the priestly tribe. (And what did the priests do? They minister before the Lord; just what John would do.) They were likely respected in their community and what we would consider “upper middle class,” at the least. 6 (John 9:3, Romans 9:10-16)- Both Zechariah and Elizabeth were godly people. “Blameless” doesn’t mean “sinless,” it just means that they loved the Lord, desired to obey Him, and kept His commands and statues the best they could, repenting when they sinned. It’s important this fact was mentioned before Luke went on to say that she was barren. Barrenness was often seen as a punishment from God for sin. Sometimes it was, but that wasn’t the case here. As Jesus would later say as he healed the man born blind, Elizabeth wasn’t being punished for sin, “but this happened so that the works of God might be displayed in” her. 8-13- The angel appears and begins telling Zechariah what’s about to happen. This is an answer to prayer (13) for Zechariah and Elizabeth. Scripture doesn’t say this, I am only speculating, but it would not surprise me if they had stopped praying for a child long ago. Elizabeth was not only barren, both of them were “advanced in years” (7). Maybe they thought God had said “no” when He had really said “not yet.” But now was God’s perfect timing. Can you think of any other Bible characters who conceived when they were old and/or had been barren for years? Several of our Old Testament heroes came into the world this way: Hannah (Samuel), Rebekah (Jacob), Rachel (Joseph), and Mrs. Manoah (Samson) were all barren until God opened their wombs. But Elizabeth’s pregnancy in old age after years of barrenness would probably have reminded her community most of Sarah (Isaac). All of these miraculous Old Testament births after barrenness would certainly have alerted Israel that John would be one to watch. Also notable is that, while the angel may have appeared and spoken to Zechariah, it was Elizabeth that God would use to bring John into the world. God is God. He could have dropped John out of the sky or grown him out of the ground like a tree. But He didn’t. He chose a woman to work through. It’s just another example of the way God values and uses women as He accomplishes His purposes. 24-25- When amazing things happen to godly people, godly people respond in godly ways. There’s no doubt Elizabeth was overjoyed that her prayer for a child was finally being answered in such a miraculous way and with such a child. But she responded humbly and modestly, staying in seclusion -possibly as an act of gratitude or to ensure a safe pregnancy- for five months. She also responded with thanks and acknowledgement of God’s grace and power in answering her prayer. Mary and Elizabeth were cousins of some degree, but their lives were very different from one another. 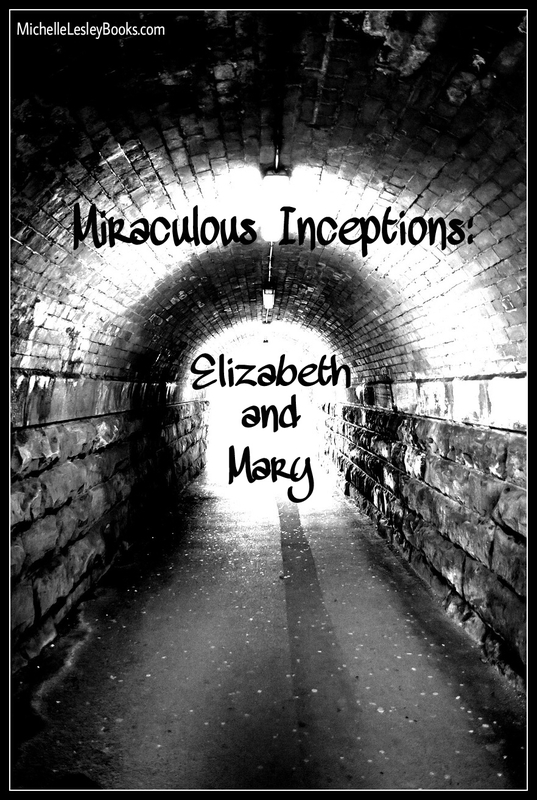 Mary was young, probably in her teens, while Elizabeth was older. Elizabeth was from a priestly lineage (Aaron). Mary was from a kingly lineage (David). Elizabeth had been married many years. Mary was only engaged. Elizabeth was not a virgin. Mary was. Elizabeth and Zechariah were financially comfortable. Mary’s family was poor. Elizabeth had been praying for a child for years. The last thing Mary would have wanted at that point in her life was a baby. 26-30- There was nothing special about Mary. She was a regular girl from a regular family growing up and about to get married. “O favored one” literally means “full of grace.” It is an expression used elsewhere in Scripture as a general reference to a Believer. Luke called Elizabeth blameless and righteous and simply called Mary a Believer. Likely this difference was to drive home the point that Elizabeth was not barren due to sin. Also, Elizabeth would probably have been more mature in the faith since she was older and had access to a live-in priest. As with Elizabeth, we see that God chooses whom He will for His own reasons. Mary was a godly young woman, and God was pleased with this, but she was a sinner just like everyone else. She had not “found favor with God” or earned her position as Jesus’ mother because she was somehow holier than other young women like her. God’s favor rested on Mary because He chose her, not because she earned it. 34-37- Both Mary and Zechariah were confused and questioning when an angel showed up and announced an unplanned pregnancy. So why was Zechariah rebuked while Mary was merely given an explanation? First, Zechariah was a priest, and knew the Scriptures intimately. He knew there was precedent for his situation (Sarah, Rebekah, Rachel, etc. ), had even prayed for a child, and should have known that God was capable of doing the same thing in his own family. There was zero precedent for Mary’s situation. She hadn’t prayed for a child, wasn’t married, and a virgin birth was unheard of. Though she undoubtedly knew some of the Scriptures, she certainly wouldn’t have known them as well as a priest. God knows the heart, and He knew that Zechariah’s question was born of doubt, and Mary’s was born of confusion, ignorance, and a desire to understand. 38- Once again, a godly woman responds in a godly way. She didn’t express what was probably a very real fear– that she would be accused of adultery and possibly stoned, or that Joseph would divorce her (which he nearly did). She simply trusted that the God who was about to do this amazing thing was big enough to protect her from whatever might come her way. Whatever God wanted to do with her was fine. She was His servant. The God who said “My power is made perfect in weakness,” (2 Cor.) has always delighted to show Himself glorious through weak, sinful, ordinary people from all walks of life like Elizabeth, Mary, and each of us. Though God will probably not do something as major in my life or yours as He did in Elizabeth’s and Mary’s lives, He is still at work in our lives, accomplishing His Kingdom purposes. And that is what is important. Too many Christians these days wear themselves out running around asking, “What’s my purpose? What’s my purpose?” when what we should really be asking is, “What is God’s purpose for His Kingdom, and how can I be obedient to Him so He can accomplish His purposes through me?” Mary and Elizabeth both considered themselves nothing more than God’s slaves, and humbly submitted to whatever God wanted to do in their lives, whether it would bring joy or hardship. Will we do the same?